This simple little track is the result of our increasing frustration with all drawbacks with Ring 2000. Ring 2000 had a rather short life. It was built to accomodate benches to work on the cars beneath it. A difference from the other tracks is that a part of it was Scalextric Plexytrack. This was also its biggest drawback. 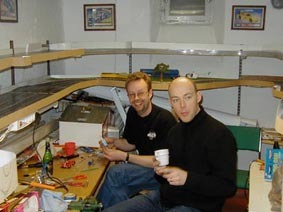 Most of us have some affection for Scalextric, but we think they shouldn´t be allowed to make such rubbish as their Plexy! Claes, Gunnar and Henke (of JPOC) have a first go just before the inaugural race. This was run as a Group C race, giving all newcomers a try with cars witout moving pickup. ...and the fact that if you were too short all you would see of it was the underside! 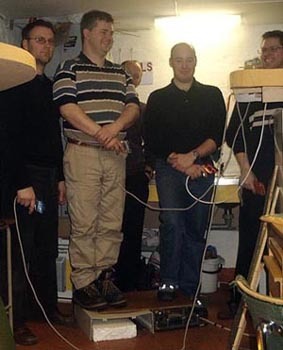 This could be solved by standing on an old computer (IBM 386). Best is to keep it assembled, otherwise it will crack under the pressure. Claes is using the internals. Another problem was that it was very cramped. Sometimes the difficulty was in the nudging rather than the fight on the track. Note Johans incredible long cable to controller. To start site in new window!